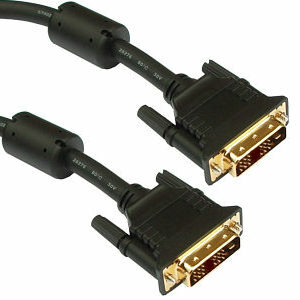 10m Professional Grade DVI-D Cable, male to male, gold plated with EMI suppressors. Gold plated contacts for minimum resistance. 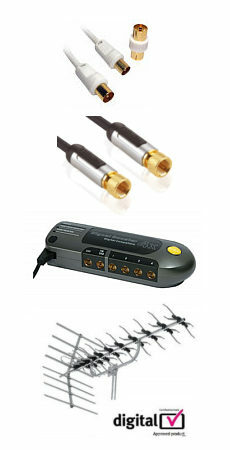 EMI suppressors for reduced interference. 18 pin single link dvi-d cable. Supports resolutions up to and including 1920 x 1200. 20m VGA Lead, Long VGA Lead / SVGA Cable. 20m VGA lead / SVGA lead. Male to Male monitor lead. HD15 Male D connector each end. Triple shielded miniature coax construction for perfect video. 14 pins connected, pin 9 (key pin) not fitted. Colour black. Length 20m. 2m Mini Displayport to Displayport Cable, Male to Male. Male to male connectors. Gold plated contacts Colour white. Length 2m. Ideal for connecting a Mac or Microsoft Surface Pro equipped with a mini displayport connector to a monitor. 1.5m Display Port Cable for DisplayPort connections. 1.5m display port cable for transferring high-bandwidth, uncompressed digital video, multi-channel digital audio and control functions. DisplayPort 1.1a HD 1080p compatible. Supports resolutions up to 2560 x 1600 and 1080p. Supports 8 channel, uncompressed 24bit audio. Bandwidth: 2.7Gbps per lane (total10.8Gbps). 10 year warranty against manufacturing defects.